Cata Electric Chimney Customer Care Numbers are provided for the customers to inquire about the issues related to Cata Electric Chimney website. Cata customer service phone numbers are provided for customers to contact the support for any information regarding cata products such as chimneys. Customers can also write a mail and get their queries resolved. Cata product portfolio consists Wall Hoods, Designer Hoods, Island Hoods, Built-in Hobs, Cooktops, Built-in Ovens, Built-in Microwaves, Dishwashers, Exhaust Fans and Coffee Machines. The company provides services regarding any issues with the above-mentioned products. The company also provides warranty facility. It provides an extended warranty which is lifetime warranty and standard warranty. For more information on Cata, its product warranty, visit the official website of the company. CATA is the first manufacturer of extraction, ventilation and heating of Spain, founded in Torelló, in 1947. Since its inception, CATA has been growing and strengthening its position in the market to reach its current leadership. In 1999 it opened its new factory of Xiao Lan, China, being the first company in the industry to expand production to that country. Cata is a part of Spectrum group which is formed by a conglomeration of several companies. It is a Spain company and manufactures a wide range of appliances that include wall hoods, designer hoods, island hoods, cooktop, microwaves, dishwashers, exhaust fans, coffee machines etc. Cata Electric Chimney is offered in stylish designs and comfortable features. 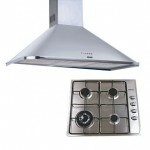 It boasts a powerful suction that absorbs smoke and to some extent it also reduces heat and makes convenient for cooking. Cata has won many awards and appreciations which symbolise their hard work and dedication for establishing themselves as one of the pioneers in electric chimneys. It has been awarded India’s most admired award and India International trade fair award. For more information regarding Cata Electric Chimney, Models, Prices, Reviews, Cata Electric Chimney Manuals, visit the Cata India website.